Current example is an "apklib" project, since that is what my real project is, but this does not seem to be limited to that type. 2) If you are doing development in a full Maven environment and need for it to have access to all the Android SDK resources like me, you may have deployed them all to your local or remote Maven repository using "maven-android-sdk-deployer" (https://github.com/mosabua/maven-android-sdk-deployer). Since Google won't/isn't putting all and up-to-date libraries in Maven Central, you have to use this and change the namespace for some resources (the couple that ARE in Maven Central) to just "android" instead of "com.google.android". If you do this, you wind up with IDEA not being able to resolve the libraries for things that depend on "com.android.google" and not resolving classes, even though when you compile there is no problem. Which results in, for example, the main Activity of my project (initially created by default with IDEA) not being able to resolve the fact that my main class is in fact a grandchild of Activity, since it's inheriting from the Sherlock class which is not getting resolved due to some confusing inability for it to resolve it's dependency through "com.google.android"... it's as if it is trying to use the depended-upon project's namespace for the library rather than just using the available tree of dependencies and their true namespace (rather than the namespace as defined in the maven <dependency> tag). Such projects also compile and run fine, so maven is properly handling the dependency and resolution of transitive dependencies. I have done numerous refreshes, rebuilding of projects, etc, and nothing fixes these issues for me. I will gladly file issues once I verify these are not the result of something I have set up wrong (and if I do, it's still probably an issue that someone this familiar with IDEA, Android and Maven would have this problem). Attached is "deptest.iml" that is from the project I built to narrow this issue down and that the excerts above are from. I've also attached the generated apklib dependency module .iml files (these are the ones generated by IDEA from the libs obtained via Maven via Maven Central). 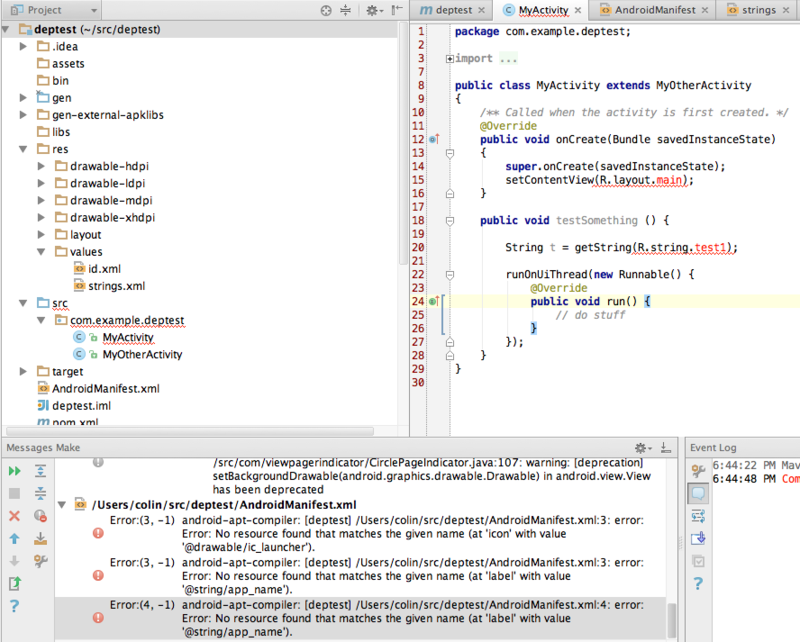 At least in this simple dependency test project, both issues I listed are fixed. Good to see these kind of things being worked out! Thanks.